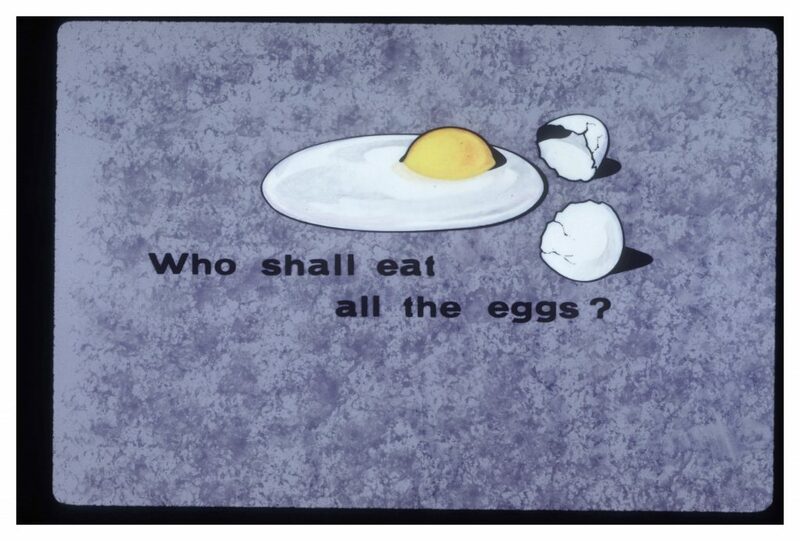 Slide from the the Donald S. Fredrickson Papers. S. Fredrickson Papers, National Library of Medicine. In a routine health examination, I am diagnosed with high serum cholesterol. During a counseling session the public health nurse goes through the different cholesterol fractions. Since the overall cholesterol level exceeds the nationally defined limit of 5 mM, and despite the fact that my risk score (the sum of cholesterol and other risk factors like age, smoking, exercise, and blood pressure) is low, I am given detailed nutritional advice. The public health nurse exhorts me to avoid certain foods, to be careful with others, and to increase the consumption of yet a third group of foods. The goal is to reduce the intake of the so-called bad, hard, animal fats and increase the intake of good, soft, vegetable fats. I am recommended to use low-fat products, some of which have a specific sign granted by the Finnish Heart Association to heart-friendly products. These products contain less salt and fat or better types of fat compared with similar regular products. Should my high cholesterol persist and my other risk factors worsen as I get older, I might be prescribed a specific cholesterol-lowering medication. From the Science News Letter, February 18th, 1961. This is a typical situation in contemporary affluent societies, faced by thousands of middle-aged and elderly persons every day. 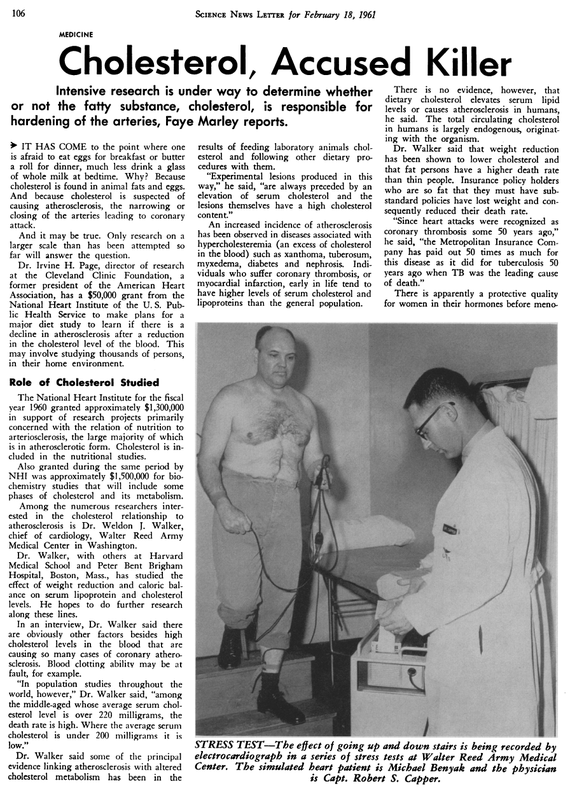 The post–World War II surge of cardiovascular diseases, together with an etiology that has implicated dietary fats and high serum cholesterol in their rise and a medical rationality centered on the notion of risk factors, has had a profound effect on patterns of food production and consumption as well as practices of medicine, public health, and personal health care. I argue that key to this assemblage is the fat/cholesterol double. It operates as a “risk object” (Hilgartner 1992), which guides efforts towards healthier eating and connects various arenas in the world of food and medicine across different scales. In the world of food, regular surveys monitor the food consumption patterns of the population. They indicate that a large portion of consumers regularly take notice of the fat content of the foods they eat. Many have changed their eating habits into more health- or fat-conscious direction. Different nutritional sects argue what type of fat in what amount is beneficial or dangerous to your health. Government-appointed officials issue meticulously weighed recommendations on fat intake, which then guide food provisioning in various settings ranging from institutional kitchens to industrial product development and labeling. Supermarket shelves are bursting with low-fat and -calorie products. Notions of fat, risks, and health have also reorganized the agricultural sector, changing the structure of dairy production. Even the very borders of nature and culture are rearranged through the breeding of the “low-fat pig” with leaner meat or the introduction of genetically modified organisms (GMOs) into food production. Moving over to the world of medicine, huge research efforts in biochemistry, medicine, and epidemiology are organized around fat and cholesterol to track the pathways of fat metabolism, uncover the functions of cholesterol in the body, or gauge the effects of cholesterol-lowering diets and medications to the morbidity and mortality of various populations. Numerous public health endeavors have been started to educate the consumers on the effects of a high-fat diet, to stress the importance of knowing one’s serum cholesterol levels, and to engage consumers in the task of cholesterol reduction. A massive industry operates around pharmaceuticals that have been developed to medicate the risk represented by high cholesterol and to offer a shortcut to lowering it. There are also novel hybrids between the worlds of food and medicine in the form of functional foods, some of which are designated to lower serum cholesterol. Hence, a few relatively simple molecules influence the operation of vast systems of food production, provision, and consumption, not to mention medicine, public health, and personal health care. In this sense, fat/cholesterol is a risk object with systemic effects. However, there is more. It is interesting to note that this risk object is a double. Depending on the context, either cholesterol or (type of) fat is evoked. Thus, it is cholesterol that is measured and medicated, but fat that is produced, regulated, labeled, and consumed. I want to argue that it is precisely this double nature of fat/cholesterol that enables the continuous and flexible exchange across different scales between the various arenas in the worlds of food and medicine. Take, for example, the labeling of various fats in food products. As a regulatory device, food labeling is geared to the idea of food as nutrition, nutrition as an avenue to personal health care, personal health care as the avoidance of future harms (i.e., risk reduction), and consumers as guardians of their individual risk profiles, which are established in the clinic. One key risk factor for cardiovascular health is serum cholesterol level. Hence, cholesterol in the clinic is connected to the fats in the products at the supermarket; food production, retailing, nutrition, and public health are all tied together through fat/cholesterol. The fact that the lipid metabolism involves several types of cholesterol or cholesterol-carrying lipoproteins—HDL, LDL, and VLDL—and several types of fat or fatty acids—saturated, polyunsaturated, monounsaturated, and ω-3, ω-6, and ω-9—complicates the picture and enables new types of exchanges, but does not change the basic situation. In some arenas, when the scale of observation is kept small, cholesterol fractions or types of fat are taken into account; in some arenas with a more crude scale, they are not. For example, when researching fat metabolism, fats and cholesterol are broken down into even more specific entities. In the clinic, when taking a blood test, the various cholesterol fractions are differentiated and the HDL/LDL relation is calculated, but recommendations are still often (erroneously) based on the total cholesterol value. Similarly, labeling practices list different types of fat on the food products, types of fat have different properties, and many animal foods contain both types of fats. Still, everyday parlance typically resorts to the crude distinction between animal/hard and vegetable/soft fats. The coupling of cholesterol/fat as a double risk object has resulted from longstanding frailties in the etiological chain from dietary fat via serum cholesterol and arteriosclerosis to infarction. The documentation of the transition from (the amount and type of) dietary fat to serum cholesterol levels in particular has proved to be problematic. On biochemical and physiological levels, the influence of fats on cholesterol metabolism and the role of cholesterol in arteriosclerosis are well documented. Similarly, in small-scale clinical interventions, serum cholesterol has been lowered successfully by a low-fat diet. The picture gets trickier when the scale gets bigger. Population studies have established connections among the fat content of diet, blood cholesterol levels, and cardiovascular and/or total morbidity and mortality. Unfortunately, not all studies have found significant links. The situation is even worse for mass intervention studies that have sought to establish a statistically significant connection between risk-factor reduction and benefits for morbidity and mortality. Several lengthy and costly large-scale epidemiological studies failed to show the link. It was only the introduction of cholesterol-lowering drugs into research that managed to deliver the necessary evidence on the health benefits of cholesterol reduction. Significantly, the results from the drug trials were then extrapolated on diet, providing the ultimate scientific evidence on which nutritional recommendations of fat use rest. (Aronowitz 1998:111‒44; Garrety 1997; Greene 2007). This testifies to the ongoing difficulty of crossing the dietary fat/serum cholesterol threshold, and the central role of the cholesterol/fat double in upholding the current heart disease prevention regime. Fresh out of the clinic with my diet recommendations, I am wondering how a simple test result, built around a fundamentally arbitrary threshold value, can influence my and others’ lives in such a profound way. Personally I will probably ignore the advice for now: after all, my HDL/LDL ratio and triglycerides levels were okay according to the test results. But I will be keeping an eye on my cholesterol, maybe testing it on a regular basis. Most likely I will be more diligent when choosing what to eat, observing the fat content of different foods at the supermarket and in the restaurant. Maybe I will also exercise a bit more, just to be on the safe side. Thus, I will be joining the millions who feel anxiety about their future health and manage their risk factors in a preemptive way, thereby paying tribute to the double risk object of fat/cholesterol. Aronowitz, Robert A. 1998. Making Sense of Illness: Science, Society, and Disease. Cambridge, UK: Cambridge University Press. Garrety, Karin. 1997. “Social Worlds, Actor-Networks and Controversy: The Case of Cholesterol, Dietary Fat and Heart Disease.” Social Studies of Science 27(5): 727–73. Greene, Jeremy A. 2007. Prescribing by Numbers: Drugs and the Definition of Disease. Baltimore, MD: The Johns Hopkins University Press.